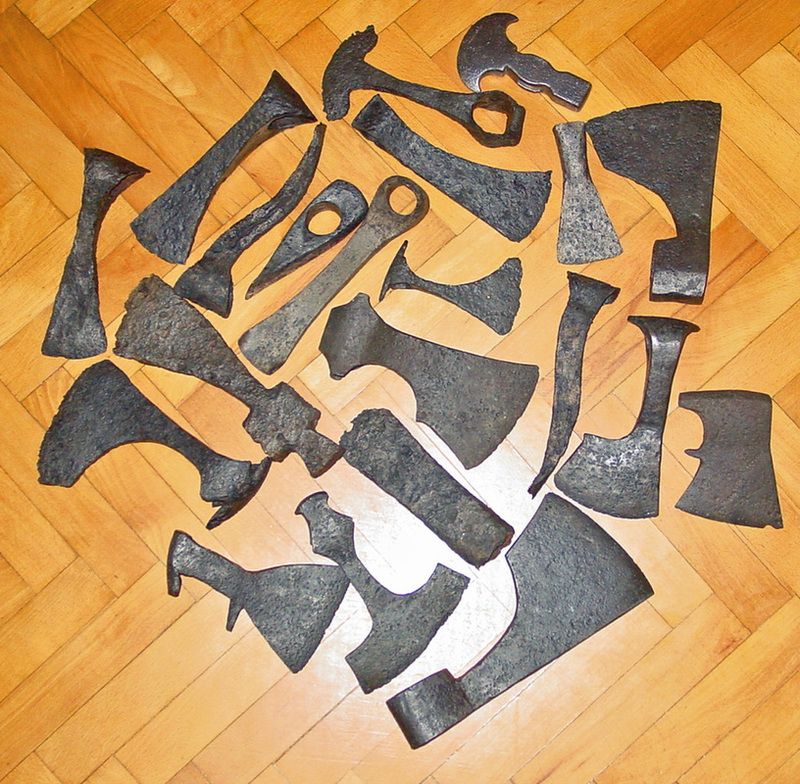 Being a tool collector for 30 years many types of other axes have intrigued me also. There are tens of thousands, perhaps hundreds of thousands of styles around the world that changed with time. Here are a few of them. While none of them were used by native Americans or traded for furs it is interesting to see what the settlers/explorers used also as well as similarities to ancient ones. Here is some of my collection & a few others. 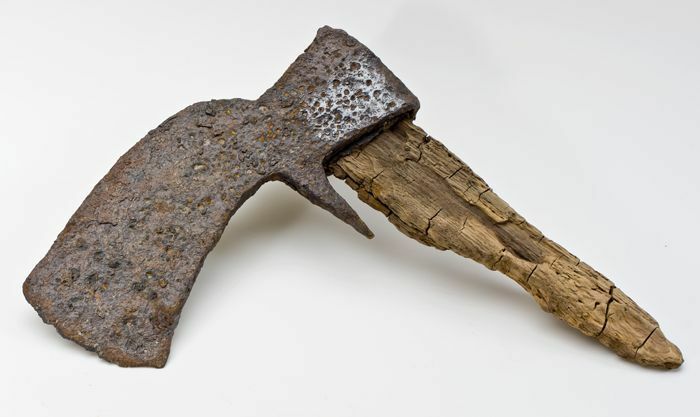 Varangian Guard warriors axe 988-1400 AD. Byzantine period. It was recently found in the Balkans while metal detecting from an area then known as Thracia during the period of use. 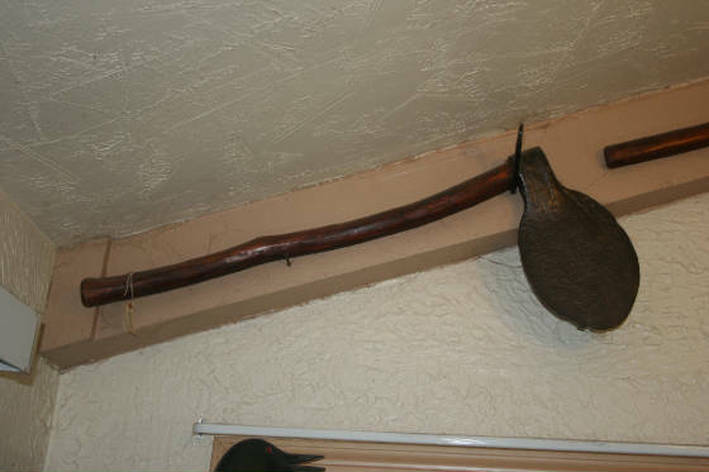 At first I thought this might be a very early broad axe but after contacting the 'World Museum of Man' curator I discovered this was made only as a weapon. 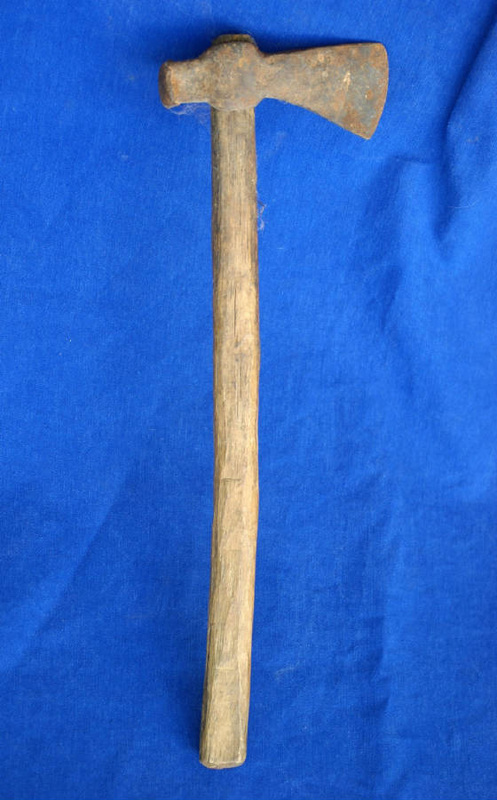 It was used with two hands and originally had a 4 to 5 foot handle. This was the principal weapon of the Varangians who served for generations in the Roman army since the 10th C. and known for their bravery in battle and loyalty to the Emperor. 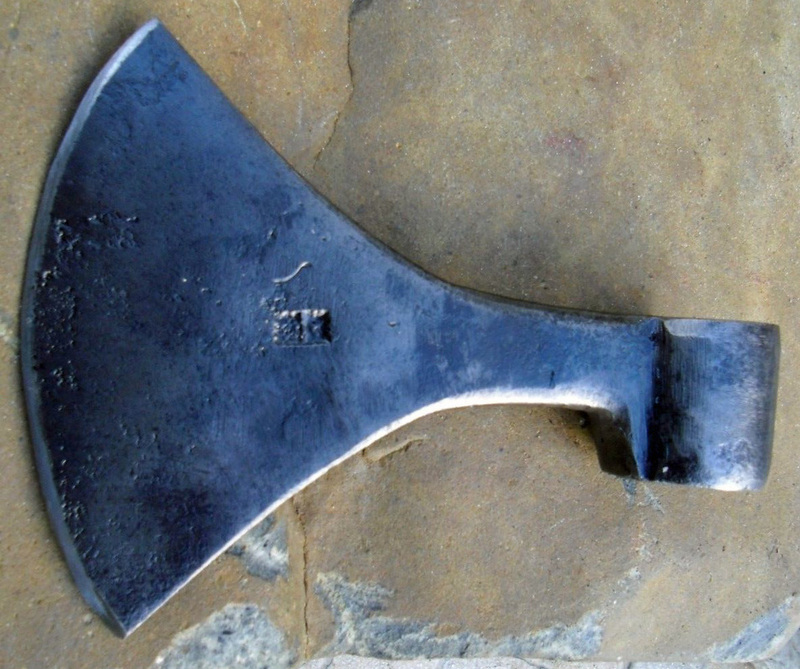 No other military axe had this shape. SPIKE BATTLE AXES SEEM TO GO BACK A LONG WAY. 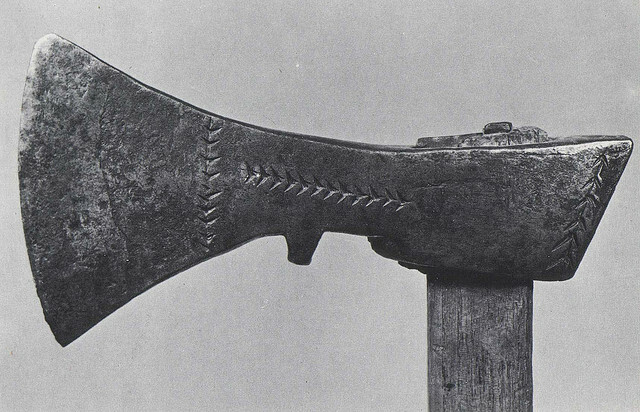 THIS ONE IS SCYTHIAN FROM THE 7TH C.
These axes are from Zimbabawea and other African countries. Some are used to this day. 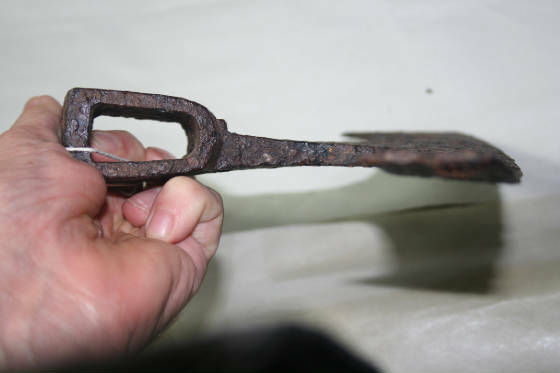 The blades were often forged in Sheffield, England and imported as trade goods to their country where they made their own handles. 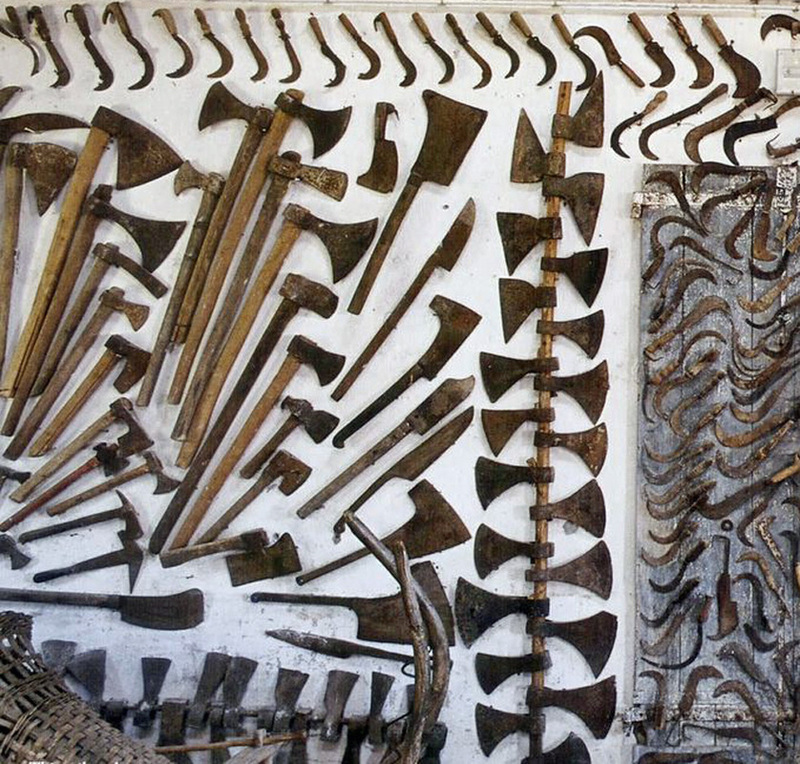 They would have been used as weapons and tools. Most are simply triangle shaped blades with the elongated points protruding into the handles like celts. 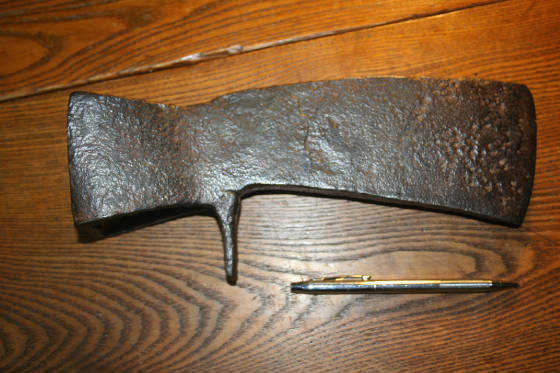 19th C. Austrian fire hatchet. 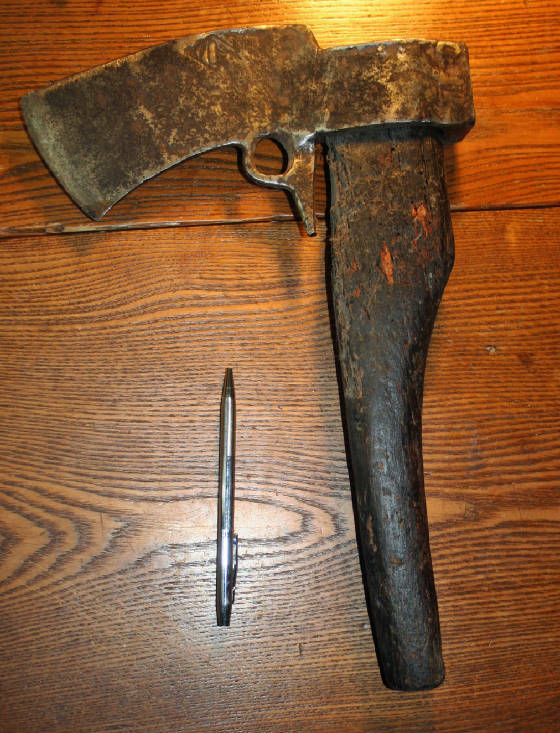 These type fire hatchets often get passed off as boarding axes. 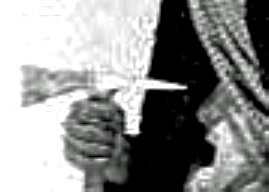 The steel pieces inserted along the handle and through the eye on the blade side and the spike side are called "langlets" are separate pieces which are riveted on the blade side & spike side. 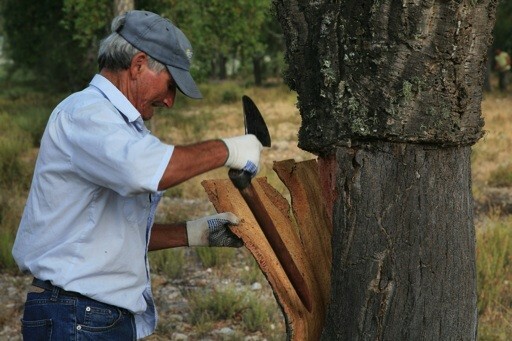 Iron strapping is always positioned on the opposite sides as in the example below. 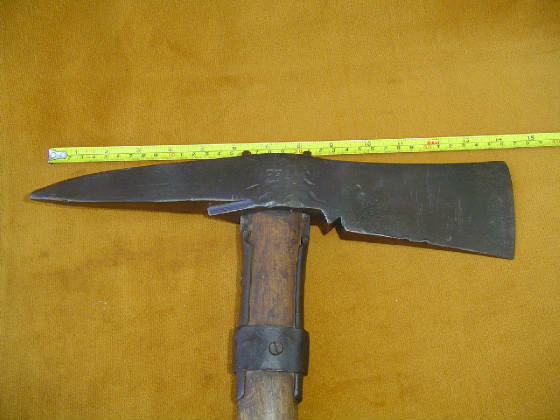 This is an old ice hatchet made in Hungary but North America made similar ones. 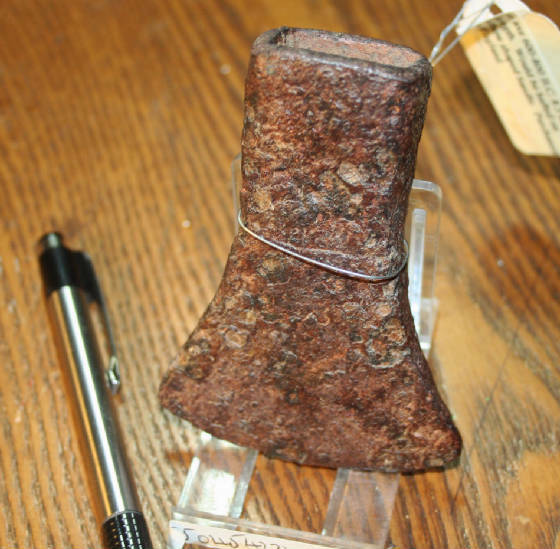 Collectors who collect 'one of a kind' type spike axes are bound to be collecting misidentified tomahawks without knowing what the others look like. 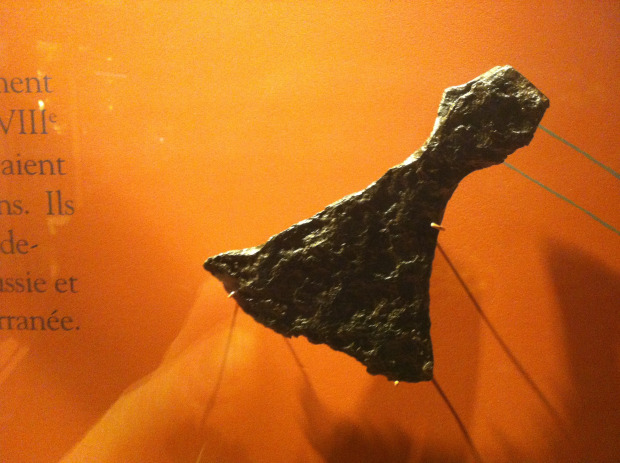 Here is a late Roman to early medieval period warrior's battle axe found in the country of Thracia (Eastern Europe). 900-1100 AD. 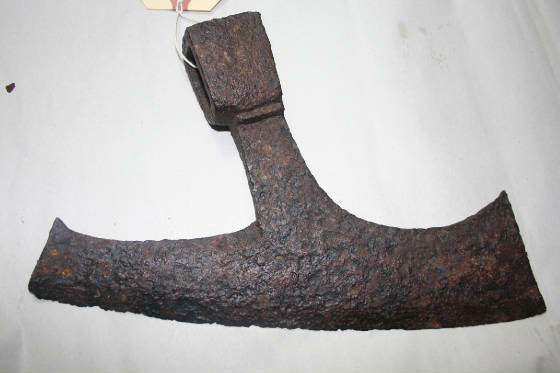 Here is a 18th C. turf cutting axe used to chop grass turf for drainage ditches or for roofing cover. 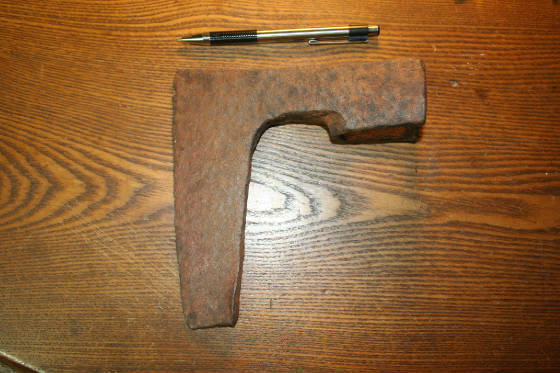 Once an initial cut was made these large axes could be pulled (or sometimes pushed) over the turf slicing as it went. Usually the blades are 14" or more in length with 4 to 5 foot handles. Turf made excellent roofing material on the frontier. 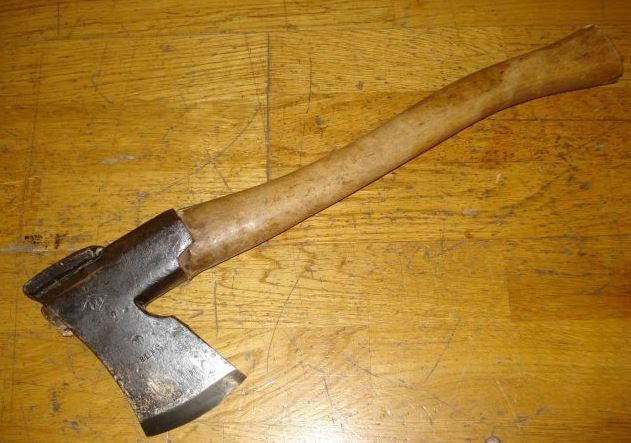 18th C. English Felling Axe which is a type of broad axe. 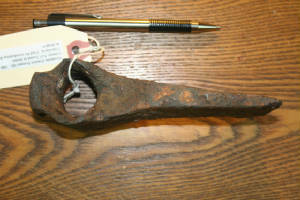 Many of these were brought to the American frontier and blacksmiths here copied them. 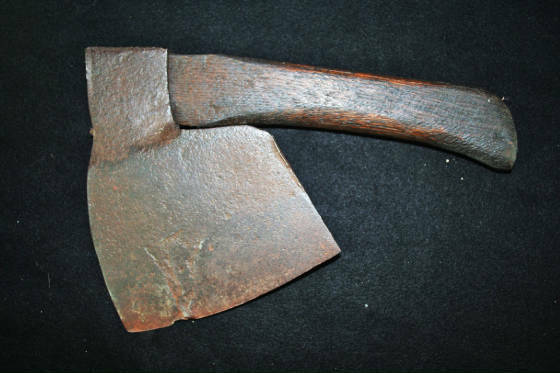 American cooper's axes were used by barrel makers to shape the staves (longitudinal pieces) and hew the edges of barrel top, etc. 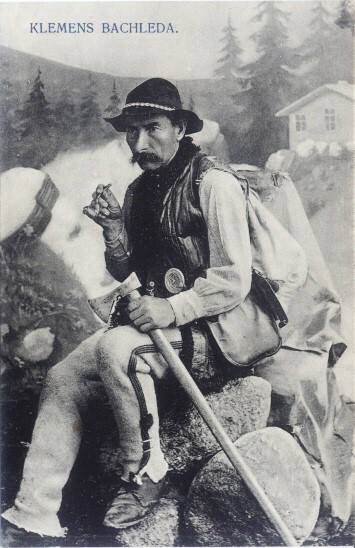 Simlar axes were used by wheelwrights making wagon wheels. This photo of a climber on Mt. 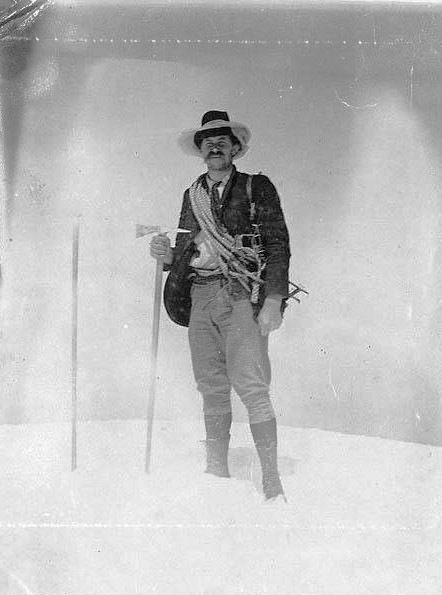 Rainier c. 1897 shows an early type of alpine spike axe with a ~4 foot handle. 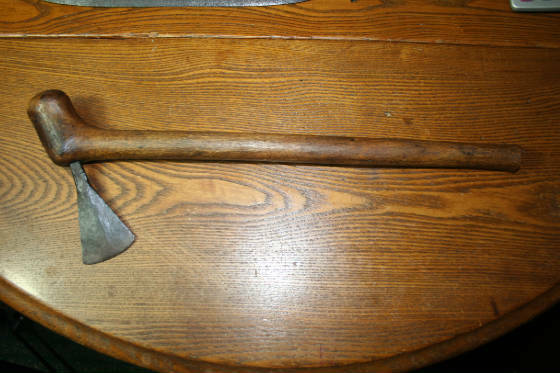 This type of climbing axe seemed to go out of favor by the end of the 19th C. when they oriented the blade horizontally. Its extremely rare to find a photo of one so I suspect they were never that common. 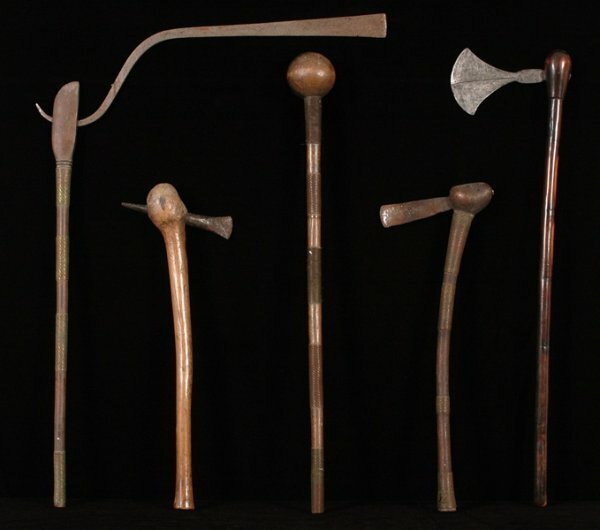 Spike axes were used in many trades and countries that most collectors are unaware of. 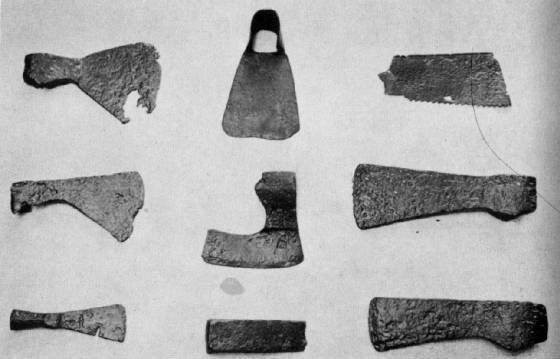 Axes & Adze from Jamestown,, VA. archaeology. All made in England. PIN RUNS THROUGH SOCKET. BROAD ARROW MARKS PERSISTED WELL INTO THE 20TH c. AS INDICATORS OF BRITISH GOVERNMENT ISSUE. 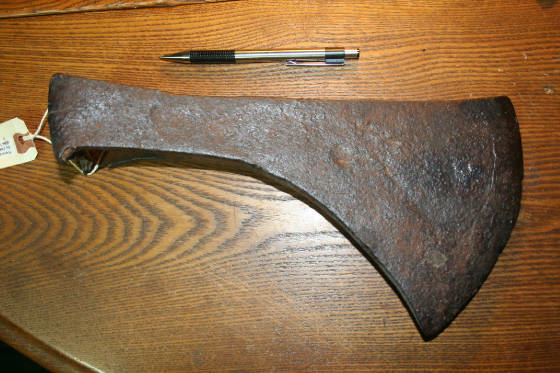 This 19th C. or earlier Spanish polled hatchet found actually in Spain has a 18" handle and 5.75" head. 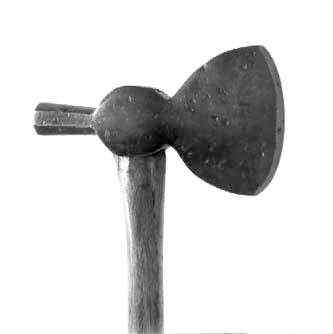 Some of these have made their way over to America in the last 50 years reborn as American frontier axes. 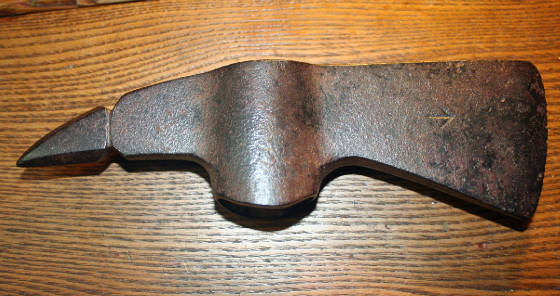 They are very similar to polled hatchets made here as well with two layers of iron slabs forge welded together around an eye. 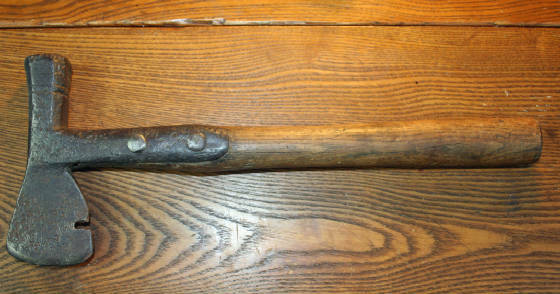 American Type III 1812 boarding axe marked U.S./N.Y.W,/ J.T. The spike has been blunted a bit.